We admit, it has been quite a while that we delivered you some news on our project. 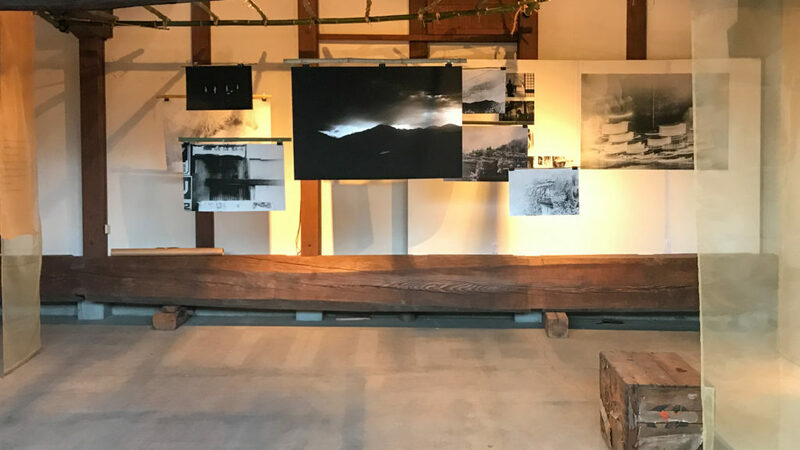 Now it is high time to update you on everything that has happened after our return from the AIR at Shiro Oni Studio in Japan, late September 2017. We came back with tons of images and poetry lines to sort through, to select and to kill quite a few darlings. What left was still an impressive amount which we put in the capable hands of Akiko Wakabayashi, a Japanese designer living and working in Amsterdam. Trained at the legendary studio of Irma Boom, the acclaimed photo-book designer. Together we went through the creative rite of finding the right voice for our story and developing the right marriage between the Kaunas and the Onishi imagery/poetry. After three not yet completely OK tries, Akiko created a version that was not only impressive but especially fitted our story. With this design, we dared to venture out in the world to find publishers and co-sponsors. When in Arles this summer, we met up again with Gintaras Cesonis, the director of the Kaunas Gallery. And it is with great pride and joy that we can now announce that they will become publisher and co-financiers of the book. Mid November, we will meet up again to talk through the final details and we foresee a launch somewhere around or just after the summer of 2019. We definitely will keep you posted! And if you want to be in on the first (signed) copies of the book… just drop us an e-mail! Today marks our last day at the Shiro Oni Residence. Later this afternoon, we will do our artist talk one more time and thereafter dismantle our exhibition. Time for some reflection on 6 weeks Japan. Before we went everybody told us that we would experience a culture shock; Japan is so different. And it is. The culture of this society brings all of its friendliness to the forefront, the human respect and awareness is something we know we will dearly miss back in Europe. Although we couldn’t read any of the signs, we experience the heartfelt connections with so many of the local people. This last day of the Kanna Art Festival however shows that humans also are a lot alike, everywhere you go. They all want to have a good time, they all want to be inspired, work and discover together and simply be around each other. It is probably the reason why one of the residents suggested to dance within the installation of one of the Japanese artists which was amazing as you can see in the image of this post. 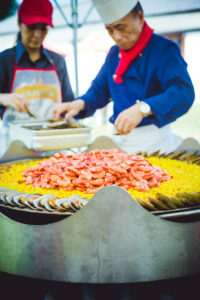 But probably the best illustration is to be seen in one of the food stands in the courtyard of the old brewery; Japanese preparing paella! Which, according to our Spanish colleague resident, was a true paella! So we know we will come back to this country and its lovely people! To present the outcome of our project, to photograph and write even more and above all experience the friendliness of the human interactions. For us it is no wonder that 77 years ago, when the Jews from Kaunas were greeted with a simple bow, a great number of them decided to stay in this wonderful society. Yesterday we had a discussion with our Japanese friends about the differences between Asia and Europe. We said that we expected a big cultural clash as all Europeans who have visited Japan said we would experience. And yes, the world is different yet so alike. Different in the fact that you are simply not able to read or understand the Japanese language. The signs make it impossible to understand what is being written. In a way that is nice. You are the easy outside who’s mind is not bothered with futile information or information you try to make any sense of. The same as we are all human. We all have our dreams, our wishes, our problems or anxieties. There is simply no difference between a Japanese person or a European or for that matter any Western person. If you only go beyond the first impressions, the outer surface and give each other the trust that opening up is OK.
Something which is not part of the Japanese culture. There you do not talk with friends on your problems or dreams. Anything to keep up the good ‘face’. The lucky ones who were handed a visa for Curacao went on a major trip through the width of Russia, to end up on a ship in Vladivostok. After a few days of sailing, they entered the small Japanese port of Tsuruga. There they were welcomed by representatives of the Jewish community of Kobe, which escorted them to Kobe to give them a new home away from home. Thanks to the little lights of two men, they escaped the dark times of WW-II to enter in the light of the Japanese culture. This poem tries to put into words what these people must have felt upon arrival. It is one of the texts used in our exhibition in the Kanna Art Festival. Here in Onishi, a number of houses are vacant. Left behind because of hope for a better future or simply because the owner passed over to another world. The funny thing is that this leads to a return ‘trickle’ of other people; the artists. Attracted by the cheap housing and the quiet rural countryside, they move from expensive and busy Tokyo to here. Giving the little town a whole new influx of different energy. 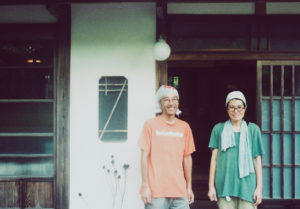 We met a couple that decided to move to Onishi to find new grounds and inspiration. In this way rebuilding not only their own future but also do their part in rebuilding the town of Onishi. They found a really nice and affordable place, renovated it and are now happy living it. Although it is next to a small cemetery which is to our Western eyes a bit strange. However these cemeteries are to be found all over. Small scraps of land, often crammed in between housing developments. Just as normal as a field of rice. Now the couple does workshops with the local kids and learn them to think beyond the box of rules and regulations provided by the Japanse society. Acquainting them with free-thinking and free-spirit.